The apartment Philomena is our largest apartment and is often booked by families or small groups. Over a small anteroom with wardrobe you come right on the left hand in the separate bedroom with a queen-size bed (140x200) and a bunk bed (90x200). The bathroom is very spacious and is combined with shower and toilet. The apartment has a very spacious living / sleeping area with about 35 m² and is the highlight of the apartment. From the living room you can enjoy at breakfast the "magnificent" view in the mountains of Schladming. Equipped with this room with a double bed and a sofa bed. Furthermore, with a dining area for up to 6 people. So you do not have to do without your favorite show while on holiday, all our apartments with flat screen TV and satellite reception are provided. 3% transaction cost per credit card with online payments. Our newly built apartment house is located in a quiet, central location on the sunny slope of Schladming directly opposite the Planai. From the balcony you have a fantastic view of the Schladminger mountain world. Since our apartment house is south facing, it offers very bright rooms and weather-dependent "sunshine" from early to late. Enjoy the fresh mountain air and the unique mountain view! The satisfaction of our customers is our priority! Our apartments therefore offer comfort in top quality. In the house Michael are 2 apartments of different sizes bookable. The apartments are located next to each other and have a common balcony. The apartments are ideal for families or small groups. Enjoy your unforgettable holiday with us in the Schladminger mountains. Skischaukel Dachstein Tauern region: Schladminger is THE winter sports resort in the Austrian Alps. The ski region has 90 ski lifts for beginners and professionals. We also have 2 snowboard parks. One on the Dachstein and one on the Planai resp. Hochwurzen. There is something for everybody. 2013, Schladming has the world championship for the second time. All the more reason to explore this beautiful ski region before. Enjoy your holiday in the heart of Austria. But not only in winter, but also in summer, Schladming has a lot to offer. These include the many mountain biketracks, wildwaverafting, golf courses, numerous mountain biking trails, the Dachstein with its ice cave, 2 bathing lakes in the vicinity of Schladming and a newly built thermal baths only 20 km away. We are a SUMMERCARD operation! If you stay with us, you will automatically receive the Summercard for free. The all-inclusive summercard gives you free entry into more than 100 top leisure activities and up to 50% discount with over 100 bonus partners. The summercard is valid from 13:00 on the day of arrival and on the day of departure! Already from one night inclusive! Over 40 holiday activities are especially included for families. Wohnung war schön, alles vorhanden und sauber! Sehr schöne Wohnung, gut gelegen sehr sauber und gut ausgestattet. Gute Lage, moderne Einrichtung, super Aussicht. 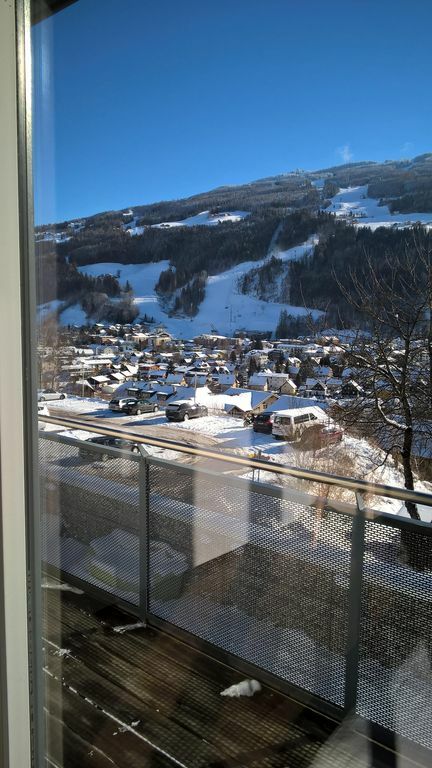 Ideally located on the sunny slopes of Schladming. Quietly situated on the edge of the forest and denoch centrally with fantastically beautiful view of the Schladminger mountains. Perfect starting point for hiking in the summer or your entry into the ski area of ​​Dachstein Tauern region. A Skisbushaltestelle or in summer City bus stop is right outside our front door and serves as a feeder to the valley of the Planai and the Hochwurzenbahnen, or to the shuttle to the Dachstein in Ramsau. Directly at the cross-country track or the forest. Perfect in summer for mushroom picking and beautiful for long walks in the woods. Only 10 minutes walk to the main square of Schladming. STORNOBEDINGUNGEN Mehr als 3 Monate vor Reiseantritt fallen keine Stornogebühren an. Bei Stornierung 3 Monate bis 30 Tage vor Reiseantritt fallen 30% des Buchungswertes, bei 30 Tage bis 7 Tage vor Reiseantritt 70% des Buchungswertes und ab 6 Tage vor Reiseantritt 90% des Buchungswertes Stornogebühren an.